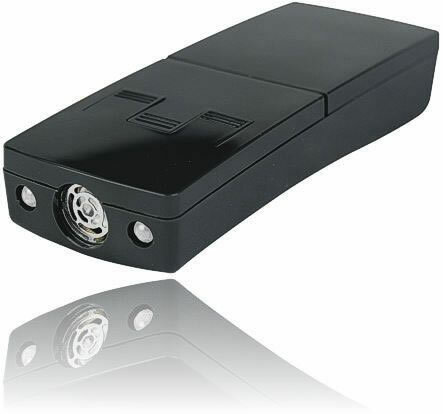 The Ultrasonic Dog Chaser is the most humane and safe way to: deter unfriendly dogs. 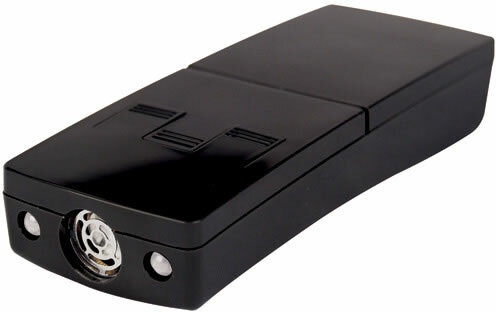 Using the latest ultrasonic technology, the Dog Chaser produces a discomforting but not harmful, high frequency dog repellent sound (20,000Hz-25,000Hz), audible to dogs but not to humans. They will "hate" this sound, and it will make them get away from you...fast! Another way this device repels dogs is a super bright LED flashing strobe that temporarily blinds and confuses them...they find it so annoying that they will also turn and run away. These two methods combined will help stop the approach of any unwanted canines up to 40 feet away. Can also be used as a flashlight, which is helpful before sunrise and after sunset, or even in a dark garage or basement. Easy to use: Just point the animal repeller at the approaching animal and press the button. You can also buy Dog Pepper Spray which is another excellent repeller. Easy as Point and Press! This electronic dog chaser is also ideal for the avid jogger, who might sometimes come in contact with a scary four-legged stranger. We all know that when it comes to most dogs, his bark is worse than his bite, and while most might not be planning on getting physical, one push of the button, and they simply get scared away by an annoying light and sound combination, but it does not cause any harm whatsoever to the pooch. This repeller is also a useful dog training device when used in conjunction with the verbal or hand command. The Dog Chaser is a safe and reliable item to own. You can have faith on your morning walks, jogs, or runs again. No need to fear checking your mail or taking your trash out again either. Its versatility shows that this is one item everyone should own! The dog chaser is one of our most popular items, and continues to receive praise because of its reliability, affordability, and small size. Using one 9V alkaline battery, it emits a high frequency sound that safely deters any canine. If you are afraid of hurting animals, or due to local laws, cannot use a self defense item to deter a dog OR cat, this is the item you want! It causes NO permanent damage to the animal, and is easy to operate. It sits well with animal lovers, but also has the power to make a jogger's route safe and enjoyable again. Never be afraid to take that relaxing jog or solo run again! The Dog Chaser's proven reliability speaks for itself. It creates an invisible shield without hurting the animal itself. Certain "no leash" laws in a few states can protect some potentially dangerous canines from an innocent jogger's defense. Never worry about that problem again! This effective device is legal to carry, and can prevent you from being hurt by an aggressive dog without having to deal with the legal ramifications of an angry owner. Another positive addition to the repeller is that it can be used as a training device. In coordination with hand signals or spoken commands, it can be used to teach dogs as well. It can also function as a dog training device by pressing the power button in conjunction with the verbal or hand command. The ultrasonic dog repeller emits a frequency ranged from 20,000 Hz to 25,000 Hz intervally which is hardly audible by humans but can be heard by dogs or cats. The dog chaser may harmlessly deter the approach of a dog or cat when properly used. The device will project these ultrasonic waves as you continuously press the power button and directly point the device toward the approaching unfriendly dog. The ultrasonic waves emitted will discomfort them and make them get away. This dogchaser will help the user establish a safe zone between the user and the unfriendly dog. A built-in LED indicator will light when the power button is depressed. When the LED does not light or is not as bright, it is time to replace the battery. To remove the lid of the battery box, slide down the battery compartment cover. Insert a 9V alkaline battery as indicated in the battery box. To ensure battery installation is correct, press the center power button to see that the LED lights comes on and are flashing. Replace the battery box lid. Your Ultrasonic Dog Repeller is ready for use. When the LEDs do not turn on or when they begin to fade, it is time to replace the battery. To replace the battery simply repeat step 1 and take out the old battery. Insert a new battery by following steps 2-4. Do not point directly at humans. Do not test the device on your own pets or a familiar animal to prevent then from confusion due to loyalty instincts. Do not let the unit come in contact with water. Do not modify or tamper with the internal components. Covering or painting over the front speaker can damage the device and cause it to malfunction or work improperly. The device may not be effective on all canines. Age, temperament, illness or training may affect an animal's behavior. It will not be effective on a deaf dog. This Ultrasonic Dog Repeller will help you create a safe zone between you and the unfriendly dogs, but always take normal precautions when confronting a dog in addition to using this device. TBO-TECH recommends carrying dog pepper spray in addition to this device as a back-up. Note from TBO-TECH: Our number one question on this ultrasonic dog repeller is "Does it work?" Our response is "yes, it does." However, it is not guaranteed to turn away every dog. Your pet, or one who knows and trusts you, may not be repelled by the discomforting sound. Deaf, rabid, or especially ferocious dogs may not be affected by the sound. Did you know that an average of 800,000 dog bites happen every year and 1 out of every 6 requires medical attention? And if you thought only Mr. Postman is prone to dog bites, according to Centers for Disease Control and Prevention, an American has a one in 50 chance of getting bitten by a dog each year. Okay, enough of the gory details. So what I'm saying is, you will never know when a dog, although provoked by your unintentional noise or any other reason can make you a part of the statistic. So what might be of help in avoiding having to go to the emergency room for a dog bite case? One is never approach a stray dog. You don't know if it's been vaccinated or if it's sick with anything. Do not be too close to a dog. No matter how cute you find that new poodle of your neighbour, it's better to be safe than never. Give the li'l doggie some space or it might force you to get some new stitches on your face. If you see a nursing, sleeping or eating dog, resist the temptation of getting too near. It will feel threatened and you know animal instinct, right? Use dog repellers. One is known as the Dog Chaser. It deters unfriendly canines with the help of ultrasonic technology. It sends off a discomforting but harmless, high frequency sound that can be heard by dogs. And as always, prevention is still better than cure. As much as possible, stay away from dogs you are not familiar with.